No man's nature is able to know what is best for the social state of man; or, knowing, always able to do what is best. In one sense it is evident that the art of kingship does include the art of lawmaking. But the political ideal is not full authority for laws but rather full authority for a man who understands the art of kingship and has kingly ability. For all good and evil, whether in the body or in human nature, originates... in the soul, and overflows from thence, as from the head into the eyes. May I deem the wise man rich, and may I have such a portion of gold as none but a prudent man can either bear or employ. Other people are likely not to be aware that those who pursue philosophy aright study nothing but dying and being dead. Now if this is true, it would be absurd to be eager for nothing but this all their lives, and then to be troubled when that came for which they had all along been eagerly practicing. They ought to be gentle to their friends and dangerous to their enemies. Serious things cannot be understood without laughable things, nor opposites at all without opposites. In the early days of his power, he is full of smiles, and he salutes everyone whom he meets. Come then, and let us pass a leisure hour in storytelling, and our story shall be the education of our heroes. ATHENIAN STRANGER: They say that the greatest and fairest things are the work of nature and of chance, the lesser of art, which, receiving from nature the greater and primeval creations, molds and fashions all those lesser works which are generally termed artificial. Until philosophers are kings, or the kings and princes of this world have the spirit and power of philosophy, and political greatness and wisdom meet in one, and those commoner natures who pursue either to the exclusion of the other are compelled to stand aside, cities will never have rest from their evils - no, nor the human race, as I believe - and then only will this our State have a possibility of life and behold the light of day. True opinions are a fine thing and do all sorts of good so long as they stay in their place; but they will not stay long. They run away from a man's mind, so they are not worth much until you tether them by working out the reason. Once they are tied down, they become knowledge, and are stable. 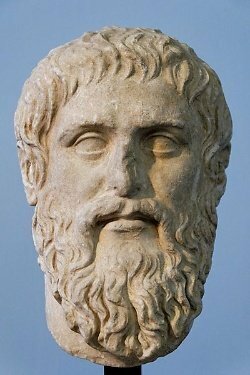 Bio: Plato was a philosopher in Classical Greece and the founder of the Academy in Athens, the first institution of higher learning in the Western world.